Veronica Lee, project leader of a task force in charge of chatbot development at Kakao Bank, said in a press conference attended by the Korea Herald that the chatbot technology is “indispensable” for the online-only bank. Customer support is one of the weak points of the bank, which saw a growth rate reaching five million customers in half a year, but wasn’t able to keep up with the staff demands that came as a consequence. 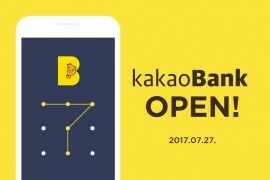 “The development project kicked off to meet the needs of Kakao Bank, whose existing customer service channels have been almost paralysed since it opened in July last year,” Lee says. The new chatbot will “enhance the quality of customer inquiries to service centres over phone calls,” she adds. Four out of ten customer inquiries go through phone calls, according to the bank. “We not only went through quantitative and qualitative analyses on questions received through the existing channel, but also tracked follow-up questions of customers on customer channels’ response,” Lee told press when talking about what answers the chatbot was equipped to answer. In full Korean fashion, Kakao Bank’s chatbot will feature video, emoticons and other features, in addition to text. The chatbot service will be available on KakaoTalk Plus Friend, and will complement existing customer channels.